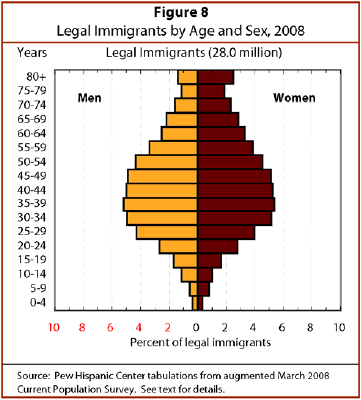 There were 6.3 million men, 4.1 million women and 1.5 million children under age 18 living in the United States as unauthorized immigrants in March 2008. 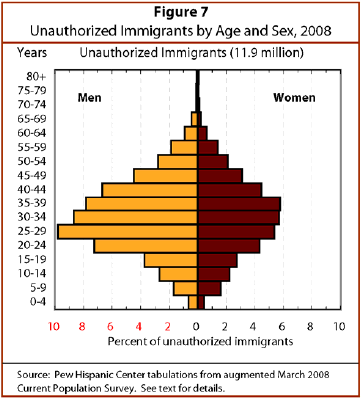 The number of men who are unauthorized immigrants has grown more rapidly than the number of women. 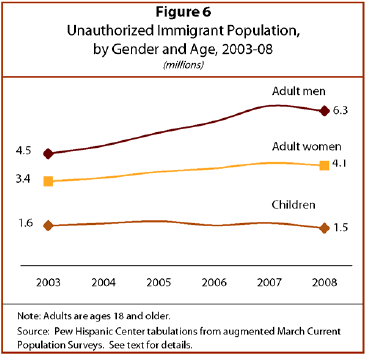 There has been little change in the number of unauthorized immigrant children since 2003 and no discernable trend. 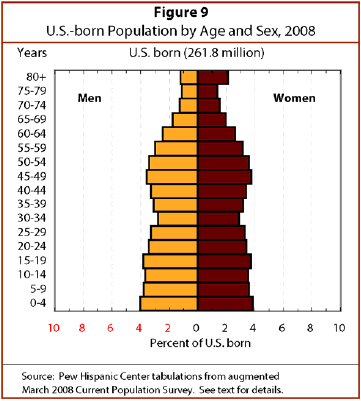 The age distribution of the unauthorized immigrant population is strikingly different from that of the legal immigrant or U.S.-born population. Unauthorized immigrants are less evenly distributed by age, with considerably smaller shares of children than the U.S. born and smaller shares of the elderly than either legal immigrants or the U.S. born population. Men ages 18-39 make up 35% of the undocumented immigrant population, compared with 14% among the U.S. born and 18% among legal immigrants. Unauthorized immigrants are much less likely to be ages 65 and older (1.2%) than are U.S.-born residents (12%) or legal immigrants (16%). Children make up a smaller share of both immigrant groups than they do among the U.S. born—13% of unauthorized immigrants and 6% of legal immigrants, compared with 27% of the U.S. born. An important caveat here is that the vast majority of children of unauthorized immigrants (and legal immigrants) are born in the United States. Because most children of unauthorized immigrants are born here, a clearer picture of the demographic structure of unauthorized immigrants and their families emerges from an analysis of household/family structure and the living arrangements of individuals. 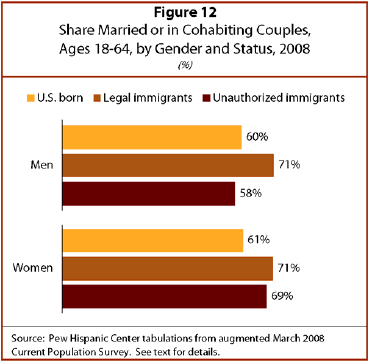 Three-quarters of the households headed by unauthorized immigrants consist of married or cohabiting couples with children; married or cohabiting couples without children; and other adults with children, mainly single parents. 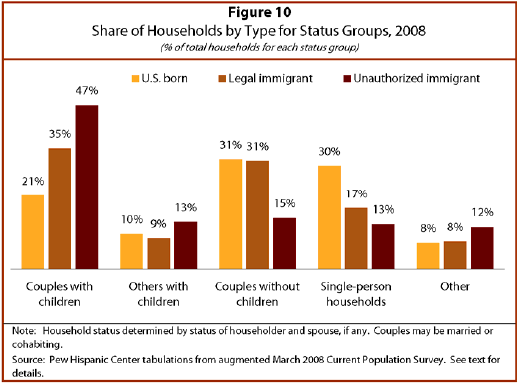 Compared with U.S.-born or legal immigrant households, unauthorized immigrant households are more likely to be made up of couples with children. A major reason for this difference is that the relative youth of the unauthorized immigrant adult population leads to a greater prevalence of couples as well as couples with children (notwithstanding an overrepresentation of young men). Nearly half (47%) of unauthorized immigrant households consist of couples with children, compared with 35% of legal immigrant households and only 21% of U.S.-born households. 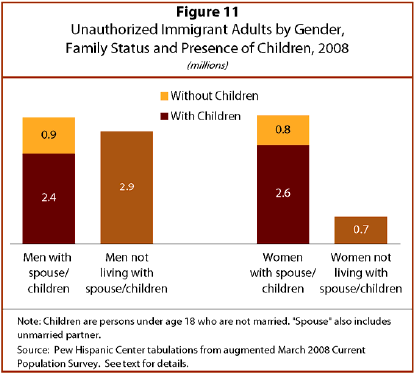 Couples without children account for 15% of unauthorized immigrant households and 31% of both legal immigrant and U.S.-born households. Single-person households are 13% of unauthorized immigrant households, 17% of legal immigrant households and 30% of U.S.-born households. The living circumstances of individuals echo the pattern seen for households. Among adults who are unauthorized immigrants, nearly two-thirds—6.7 million—live with a spouse or a cohabiting partner (either with or without children). The share is higher for women (83%) than for men (53%). Most of this group (5.1 million) live with a spouse. Most of these unauthorized immigrants who live with a spouse or cohabiting partner—4.3 million—also live with their children under 18. This means that nearly half of all adult unauthorized immigrants (48%) live with their children. However, the share of adult women living with their children (64%) is substantially higher than the share of men (38%) among unauthorized immigrants. Nearly all 1.5 million unauthorized immigrant children live with their parents. There are 3.6 million unauthorized immigrants who do not live with a spouse, partner or children.2 These “unpartnered adults without children” are 35% of unauthorized adult immigrants, a share unchanged since 2005. Nearly half of men (47%) fit this description, as do 17% of women. The number of men in this group has increased since 2003; the number of women has not. Comparing undocumented immigrants with others, men ages 18-64 who are unauthorized immigrants are about as likely to live with a spouse or partner (58%) as are U.S.-born men (60%), but they are less likely to do so than other foreign-born men (71%). Among women ages 18-64 who are unauthorized immigrants, 69% live with a spouse or partner, which is about the same as other foreign-born immigrants (71%) but higher than the 61% share among the U.S. born. The number of children of unauthorized immigrants increased by 1.2 million from 2003 to 2008, despite the fact that the number of unauthorized immigrants under age 18 has remained roughly constant. The growth has been children born in the United States. In 2003, of the 4.3 million children of unauthorized immigrants, 2.7 million, or 63%, were born in the United States. In 2008, of the 5.5 million children of unauthorized immigrants, 4 million, or 73%, were born in the United States. Because of the underlying dynamics of immigration and childbearing, the youngest children of unauthorized immigrants are considerably more likely than older ones to be U.S. citizens. Among children under age 6 whose parents are unauthorized immigrants, 91% were born in the U.S.; among those ages 14 to 17, 50% are U.S. born. 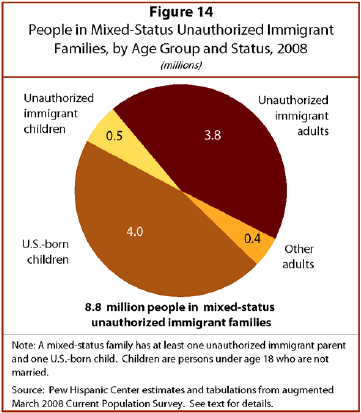 The vast majority of all children with at least one unauthorized immigrant parent live in two-parent families (80%). This is similar to the share of children of other immigrants who do so (84%) and higher than the share of children with U.S.-born parents (71%). Mixed-status family groups—that is, families with unauthorized immigrants and their U.S. citizen children—consist of 8.8 million people. Of these, 3.8 million are unauthorized immigrant adults and half a million are unauthorized immigrant children. The rest are U.S. citizens (mainly children) and legal immigrants. Since 2003, the number of children (both U.S. born and unauthorized) in these mixed-status families has increased to 4.5 million from 3.3 million. This increase is attributable almost entirely to the increasing number of U.S. citizen children living with undocumented parents. The number of children in mixed-status families who are themselves unauthorized immigrants has remained constant. 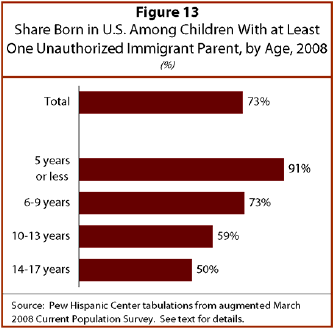 Looked at another way, 3.8 million unauthorized immigrants are parents of children who are U.S. citizens. They represent 37% of adult unauthorized immigrants, a figure that has remained essentially unchanged since 2003.